Have you seen or heard? 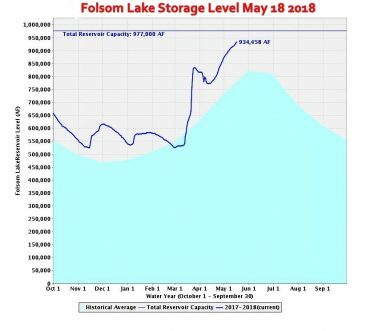 Folsom Lake is 96% full, which is 120% of the average for this time of year. The lake level usually peaks about June 1, and the dam operators draw down from there, usually bottoming around December 1. I don’t know if this means a nice long boating season, as we still need steady water flowing down from the Sierras. We’ll see about that, but for now, just beautiful… It’s time once again for the Folsom Rotary Club’s annual Wine and Dine. Happening Sunday, you’ll get the chance to try wine and beers from the around the region, as well as tasty treats from local restaurants, proceeds go toward a great cause, and it’s only forty bucks! Tickets here … Red’s Blues plays Sunday at 3pm at Powerhouse Pub. What? You didn’t know they had live blues at powerhouse every Sunday? It’s true! Bring your axe and stick around for the blues jam session at 7pm…. As for me, I’ve got my grandson in town. I think we’ll head out to the Folsom Zoo Sanctuary to see the local critters, maybe a train ride, and a visit to Snook’s … Go out and make it a great one!